I know I haven’t been posting recipes as often that I thought I would. Truth be told, I only want to post recipes on here that I actually like. So, although I’m cooking quite a bit for this class, some of the recipes aren’t up to my high “palatability” standards. I actually liked this recipe I am about to post. 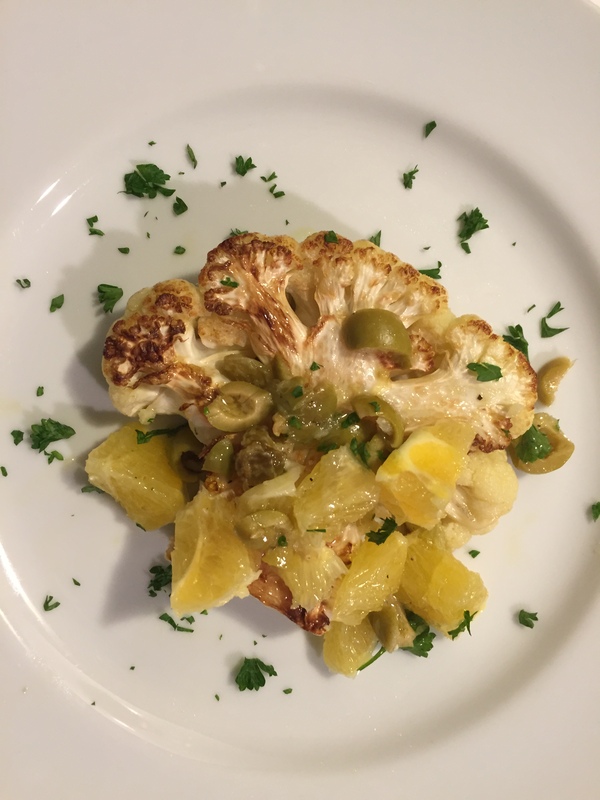 Rouxbe, in the class, offers up cauliflower steaks four ways, but this is the one that looked most interesting to me. And the Pistou is my favorite part! Crisp yet tender cauliflower ‘steaks’ served with a surprisingly refreshing pistou, made with green olives, orange segments, golden raisins and extra virgin olive oil. 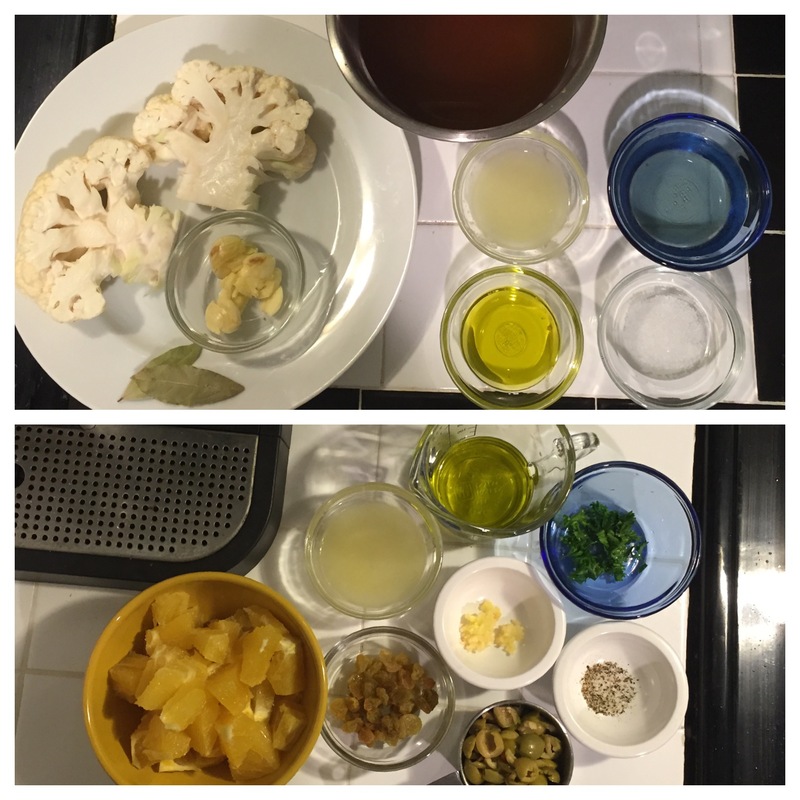 To bake the cauliflower, first preheat the oven to 350°F (175°C). *NOTE: Do NOT core the cauliflower. The stem is needed to keep the ‘steaks’ intact. With the cauliflower sitting on its stem, cut in half through the middle. Trim the outer edge of each half to form a thick steak-like piece of cauliflower. Each piece should be approximately 1 1/2 inch thick. In a 9×11 baking dish, mix together the garlic, lemon juice, stock, white wine, olive oil, bay leaves and salt. The amount of salt will depend on how salty your stock is. Taste for seasoning and adjust as necessary. Place the cauliflower into the liquid and cover tightly with foil. Carefully transfer to the oven and let bake for approximately 30 to 45 minutes. Ultimately, the time will depend on how thick the ‘steaks’ are and your oven. Test the ‘steaks’ periodically. When a knife goes in somewhat easily the cauliflower is done. Note: The cauliflower should be cooked through, but still a bit firm. If it’s too soft, it will fall apart during frying. Meanwhile, go ahead and prepare the pistou. To make the pistou, combine together the oranges, lemon juice, olives, garlic, parsley, raisins and olive oil. Gently toss to combine and taste for seasoning. Add salt and pepper to taste. To finish the dish, remove the cauliflower from the oven and carefully remove the foil, making sure you don’t burn yourself from the steam. At this point, remove the ‘steaks’ from the liquid and place onto a plate lined with paper towel. Blot the top of cauliflower with paper towel as well. This step helps to ensure you get a nice golden crust. Next, heat a large fry pan, or cast iron skillet, over medium heat. 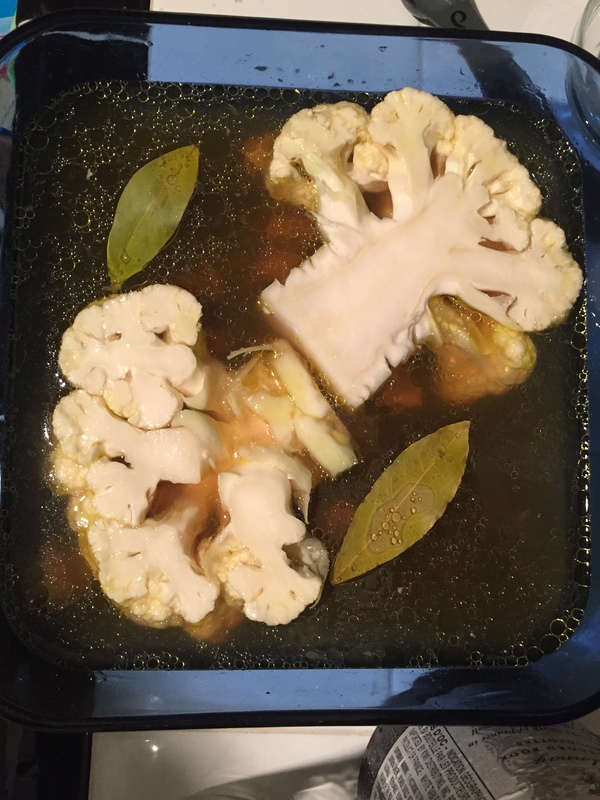 Once hot, add the oil, followed by the cauliflower. 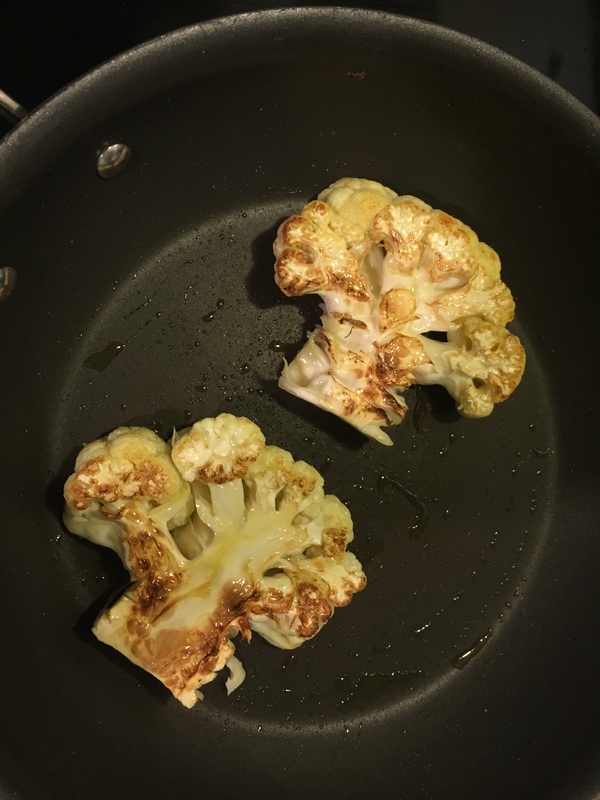 Let the cauliflower cook for about 4 to 6 minutes, or until golden brown on each side. Try not to fiddle with the pieces too much, otherwise the ‘steaks’ will start to fall apart. this would probably work better with a non-stick pan for a more golden crust. Once done, transfer to a serving plate and top with half of the pistou. If desired, drizzle some of the pistou juice around the plate and finish with freshly ground black pepper, if desired. I love all the flavors of this dish. I think it’s more of a summertime dish, but nonetheless, I enjoyed it as a light vegan meal.